What should I include in my wedding invitations suite? Wedding invitations are one of the most essential parts of your wedding planning, they are the start of the journey for style and set the tone for the vision of your day, so it’s really important that you get them right! 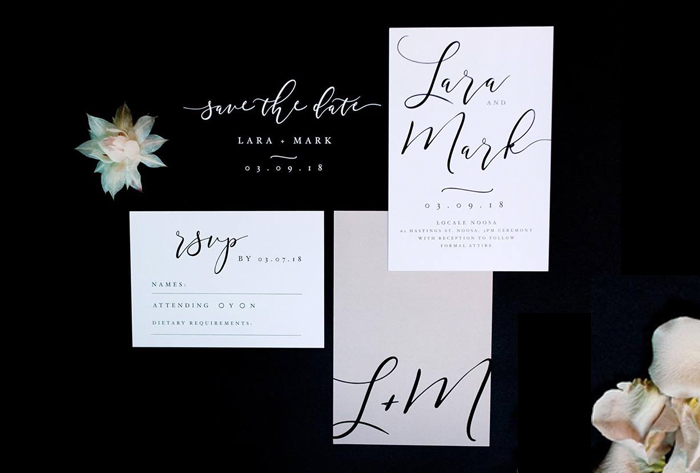 Invitations are so much more than just providing date, time, place of the venue & dress code. This is a great opportunity to answer a variety of questions and show your guests that you want them to have a wonderful stress free time at your wedding as well. It’s important not to overload your guests with information but at the same time give them a feel for what your day is going to be like. Children: if you are not planning on having children present at your big day you may want to organise a babysitting service at the venue or close-by for children and this information can also be put onto the invitations. Transport: if you are organising a bus to transport your guests to and from your venue, then include these details. Accommodation: if your guests are travelling a distance encourage them to book their accommodation early and provide suitable recommendations. Gifts: This can be a delicate topic and a creative way to convey to your guests if you are having a wishing well, a registry or if you really don’t want anything at all is with a poem. Dietary requirements: Guests can have a range of dietary requirements that you’ll need to consider. This is something you would have a space for on your RSVP card. If you have lots of directions, or fine details that you’d like to let you guests know about, it might be an idea to add these to a wedding website or alternatively pop your guests an email.